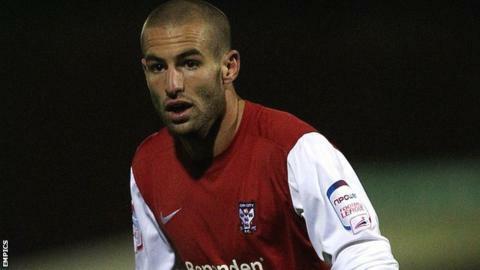 York City midfielder Matty Blair is on the mend after being hurt in a clash with a training ground dummy earlier this week. The 22-year-old is expected to be fit to take his place in the side to face Dagenham & Redbridge on Saturday. Boss Gary Mills told BBC Radio York: "Matty Blair had a bit of a bump with a mannequin on Monday and cut his knee, we thought he might need stitches. "He stumbled with Michael Potts and fell into it." Mills added: "He's been getting a bit of stick about it because we think he might be the first player to be tackled by a mannequin." The former Kidderminster player has scored twice in 15 appearances for the Minstermen this season. It is not the first time this year that a member of the Blair family has suffered a bizarre injury. In March, dad Andy, who was part of the Aston Villa squad that won the European Cup in 1982, broke a metatarsal when he fell down some stairs celebrating a goal by his son in the FA Trophy semi-final win at Luton.